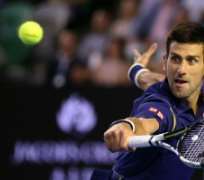 Novak Djokovic has been crowned the Australian Open champion for a record-equalling sixth time thanks to a 6-1 7-5 7-6(3) victory over Andy Murray in Melbourne on Sunday. Of the Serb's sextet of triumphs on the Rod Laver Arena, four have now come at the expense of Murray, who is still without a victory from his five outings in the final of the first Grand Slam event of the year. The two players headed into the tournament ranked as the world's top two players, yet there was a huge gulf between them throughout the opening set. World number one Djokovic, who wrapped it up in just 32 minutes, was in total command as a frustrated Murray was left to bemoan his luck and display up until that point. To the Scot's credit, his performance levels improved thereafter, but not enough to prevent Djokovic from winning through in straight sets. Both players recorded a break apiece during the second set to level it up at four games apiece, only for Djokovic to then crucially break again when a tie-break looked inevitable. The third set did in fact reach a breaker as Murray responded positively to being broken in the very first game. However, two double faults then handed the initiative to his fellow 28-year-old, who did not pass up the opportunity as he wrapped up the 11th Grand Slam title of his career in four minutes shy of three hours. The result means that Djokovic has a near-perfect record at the Australian Open since 2011, having lost just one match during that period.